Nice side grilles and sharp graphics. Detailed hydraulics run to the track drive motors. Boom rams are locked by grub screws. Loader arm has a big hook. Poses well with other models. 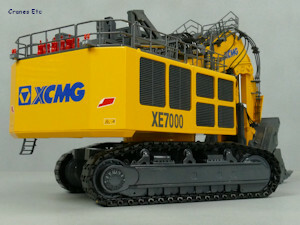 Although the model has been produced, at the time of the review there is little information available about the real machine. 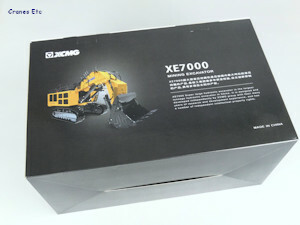 The model comes in a large XCMG branded box which has a plastic carry handle. 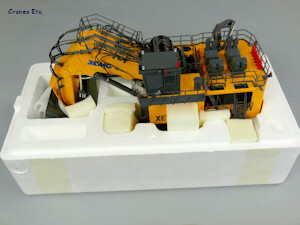 Inside the box, the model is contained within a pair of expanded polystyrene trays. The model is strapped down to the bottom tray so has to be carefully unpacked. 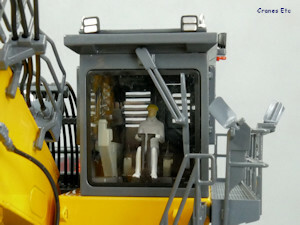 The review model had no missing parts, but one ladder was detached in the box and was easily refitted. No information is provided about the real machine. Two tools are provided with the model: a pointer and a key. 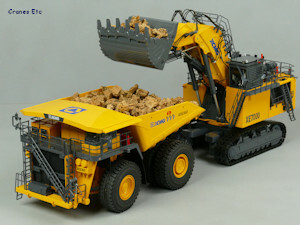 This is a large and heavy model. Looking underneath, there is detailing with hydraulic hoses running to the track drives, and there is an access ladder adjacent to the slewing ring. The track motors appear to be plastic but the colour match is excellent. 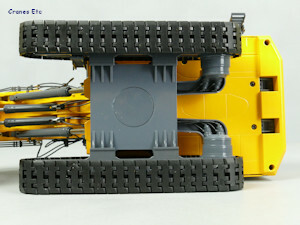 The track frames have lifting eyes in the casting, and there are working rollers top and bottom. 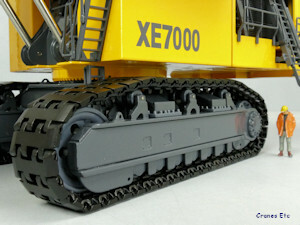 The tracks are metal and heavily built as befits such a large machine. 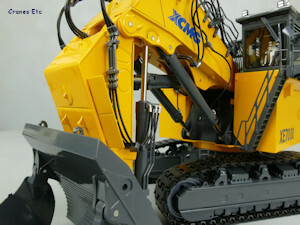 The body is large, with nice plastic grilles on one side, and there is some subtle detailing with bolt heads in the casting. The graphics are very sharp. Various lights and cameras are detailed, and at the bottom a toothed slewing rings is visible. Around the roof there are excellent metal hand rails, fire suppression equipment, and four fans are visible under fine mesh grilles. 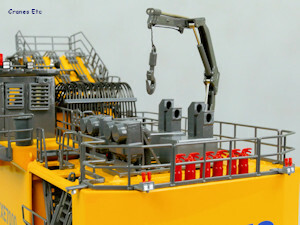 The exhaust stacks are plastic, but again the colour match is excellent, and there is a hydraulic arm used for maintenance work. However, the hook on it seems over large. Looking down inside the central well the slewing motors can be seen. The boom and stick are suitably massive and metal handrails run to the top of the boom. 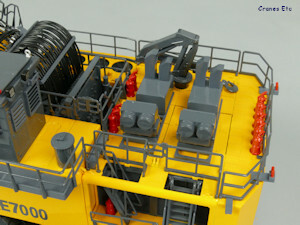 The detailing of the hydraulics is excellent with hoses and pipes, and very nice connectors. 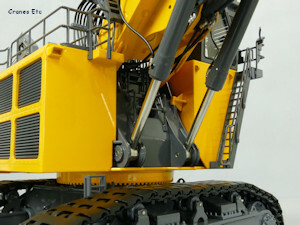 The hydraulic rams are very nice parts with metal jackets and nice hose connections. 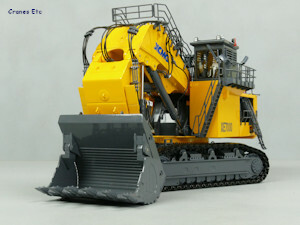 The shovel is massive and it has lifting eyes and hydraulics run to the internal rams. The detailing of the teeth is impressive. The tracks are tensioned by spring-loaded idlers. They turn easily enough by hand. Rotation of the body is very smooth with no rocking. The rear access ladder can be lowered, and also removed. 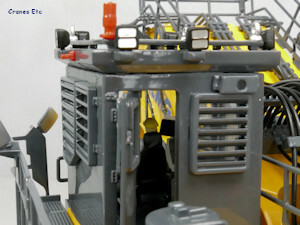 The door of the operator's cab opens. 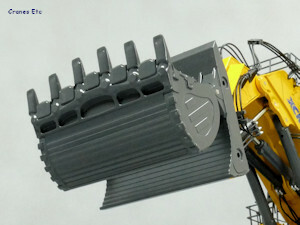 The maintenance loader arm can be rotated and unfolded. The winch is fixed. The boom, stick and bucket have a good range of movement. The rams operate nicely and four of the six can be locked in position by using an allen key on grub screws. This system works very well and is preferable to extremely stiff rams. 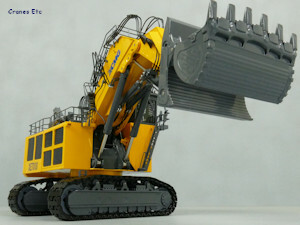 The shovel opens wide to discharge its load. 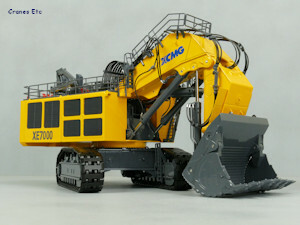 This model reflects the heavy nature of the real machine and is robust and well made. It has a high metal content with plastic used appropriately. 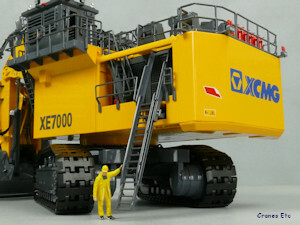 It compares well with models of a similar size and type. 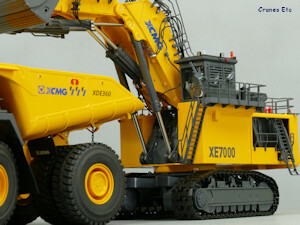 Yagao has been a long term supplier of models for the XCMG company. 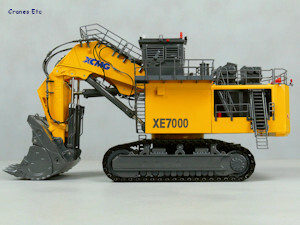 This model is excellent and compares very well with other models of machines of a similar type. It was released in March 2018. Detailing is very good on top. Metal tracks and working rollers.